J.W. 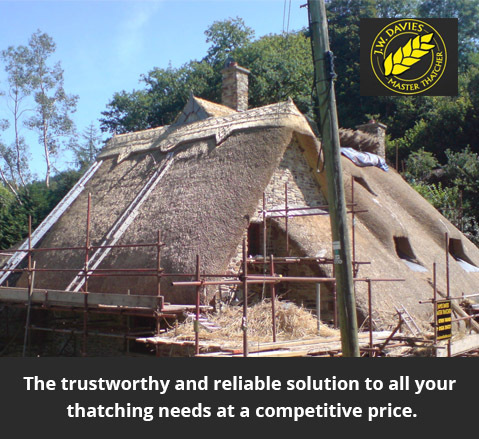 Davies, the Devon Master Thatcher, has been working with thatched roofs for several years both re-thatching and re-ridging them. Using both locally sourced and imported water reed and wheat reed, J.W. Davies can help to restore your home's appeal and integrity. With skills that have been passed down from generation to generation, J.W. Davies not only has the experience and knowledge to get the job done, he is also reliable and trustworthy so you can have peace of mind that your re-thatch or re-ridge will be completed to a professional standard. If you wish to see some of our previous projects, you can do so by clicking here. If you are still not sure, see what others are saying here. Alternatively, you can view our website by clicking the button below.